When CSI: NY heads to San Francisco for an early October episode, the gang will be joined by a former thirtysomething fave. Peter Horton, who played thirtysomething's Gary, has been cast as a California-based FBI agent who once dated Jo (Sela Ward). While visiting New York, Horton's character will reconnect with Jo and help her and Mac (Gary Sinise) with a case that concludes in the City by the Bay. ~ A man gets mugged while crossing the Brooklyn Bridge, and he dies. They find an envelope with him, which contains three photos of a young woman. She has been badly beaten, but they don't know whether she's alive or dead. ~ They are able to identify the young woman in the photos as Mary. The 15-year-old girl's parents reported her missing two weeks ago. ~ Mary has an ATM card, and the team discovers that she withdrew all of her money the night she went missing, after having an argument with her parents. Mary's father doesn't like the suggestion that Mary ran away, but the team has to consider every possibility. Her parents just want to know what happened to their little girl, and they want the person who hurt her to pay for what they've done. ~ The search for Mary leads the team to San Francisco. ~ Peter Horton's FBI agent character is named Cade (last name, I assume). ~ Jo's (now 14-year-old) daughter Ellie appears in this one, and she's got a boyfriend. Jo and Cade catch them kissing, and there's a bit of an awkward introduction. ~ It looks like Natalie Martinez's character is named Lovato (again, last name obviously). Not sure if this is her first appearance, but we'll definitely be meeting her by 9.03. She seems tough and capable while chasing a perp and intimidating him a bit during the interrogation that follows, and we also see her apologizing in Spanish when police business interrupts a busy woman trying to take care of several young children. According to a blurb in the San Francisco Chronicle, CSI:NY will be hitting the road again next week, but instead of heading to NYC as they usually do once or twice a season, the show is going to San Francisco. According to the story, filming in San Francisco starts Monday, August 13, for an episode that partially takes place in San Fran. In the episode, which will air in early October, Peter Horton will guest star as a California-based FBI agent who once dated Jo (Sela Ward). While visiting NYC, Horton’s character will help Jo and Mac (Gary Sinise) with a case that brings them to San Francisco. If you spot CSI:NY (which normally films in Los Angeles) shooting in San Francisco, let us know about it at olv@onlocationvacations.com! ADAM: You bet! And Christine (guest star Megan Dodds) will have played a big part in getting Mac back on his feet after being shot in the finale. "That relationship is still going strong," executive producer Pam Veasey tells us. "She was part of his rehabilitation, so they've definitely grown closer. She is very supportive of him. He is very happy in this relationship, as is she." And although Veasey promises the relationship will be challenged and explored, she concedes that the season (series?) "will ultimately end with a great deal of happiness for Mac." Hmmm, wedding bells, anyone? ~ Flack chases after the shooter, who ducks into an alley and ditches the gun in a dumpster. A pair of 9-10 year old kids, Lonnie and Aimee, are playing with a soccer ball nearby, and Lonnie moves to retrieve the gun after the shooter jumps over a fence. Meanwhile, Flack approaches the alley with his gun drawn, and he turns the corner just in time to hear a gunshot. Lonnie has accidentally shot Aimee in the stomach, and Flack rushes forward. He puts pressure on the wound, trying to keep her safe until help arrives, but the paramedics are unable to save her. ~ Meanwhile, Mac is getting impatient with the lack of progress regarding his memory issues. However, he hasn't told Christine or his colleagues that he's having trouble. "Reignited" — The CSIs investigate when a fire chief – a friend of Mac’s – is killed in a blaze that used the same technique as a recently paroled arsonist, on the ninth season premiere of CSI: NY, Friday, Sept. 28 (8:00-9:00 PM, ET/PT) on the CBS Television Network. Rob Morrow (“Numb3rs”) guest stars as Leonard Brooks, the arsonist. 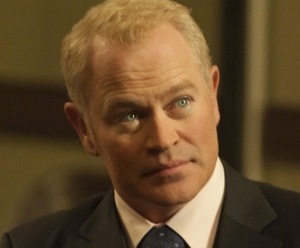 Perpetual TV baddie Neal McDonough‘s latest role finds him on the right side of the law for once. TVLine has learned exclusively that the ill-fated Justified gangster has nabbed a guest spot in CSI: NY‘s upcoming ninth season. He’ll play Senator Gordon Hamilton, a character sources at the show refer to as the “ultimate politician.” While speaking at a crowded campaign rally, the senator will find himself in the middle of a shootout. Both he and CSI Lindsay (Anna Belknap) — who also attends the event — will be injured during the fray. McDonough — who is slated to appear in Episode 4 of the CBS procedural’s upcoming year — most recently shot Frank Darabont’s buzzy TNT drama pilot, L.A. Noir. The fast-paced period thriller centers on the 1940s/50s-era epic battle between determined Los Angeles Police Chief William Parker (McDonough) and boxer-turned-mobster Mickey Cohen. CSI: NY, meanwhile, kicks off Season 9 on Friday, Sept. 28 in its new 8/7c time slot. ~ Adam's Avalanche gets stolen, so he has to wait in the bullpen (the part of the police station where Flack's desk is located) to file a report. While he's there, he sits with two young girls who are waiting for their mother to get done with a lineup. He tells them a story about a "princess" to keep them (and himself) occupied. ~ The story is actually a case the team worked, and the episode features flashbacks to the events as Adam tells the girls what happened. The crime scene was near Belvedere Castle in Central Park, where a dead woman wearing a ballgown was found in the water. ~ Also, Adam found a piece of a "spaceship" near the crime scene, a golden shard of metal with traces of space dust on it. Exclusive: Meet CSI: NY's New Lucy Messer! Even on TV, little kids grow up. So in CSI: NY's upcoming ninth season, Lucy Messer will look a little older! The CBS procedural has tapped Brooklyn Silzer to play Lucy, the daughter of married CSIs Danny (Carmine Giovinazzo) and Lindsay (Anna Belknap). Silzer, who has also played Robin and Patrick's daughter Emma on General Hospital, will appear in the new season's fourth episode. Lucy was previously played by twins Nadia and Talia Hartounian. While many fans welcome any chance they get to see the Messer family together, this episode may not be such a happy occasion. While attending a campaign rally for Senator Gordon Hamilton (guest star Neal McDonough), the family lands in the middle of a shootout, which injures both Lindsay and the senator. We hope little Lucy is OK! Given Silzer's casting, it's possible viewers will see more of Lucy this season. Executive producer Pam Veasey recently told TVGuide.com that the new season will take a closer look at all of the CSIs outside of work. Season 9 of CSI: NY kicks off Friday, Sept. 28 at 8/7c on CBS. Silzer's episode is expected to air some time in late October. ~ In 1992, an 8-year-old boy named Tommy went missing after he took his dog for a walk in the park. Although Tommy was presumed dead, his body was never found. The main suspect in the boy's disappearance was Craig, a 17-year-old local troublemaker, but he was never convicted. He left the city after the investigation, but he returns on the 20th anniversary of Tommy's disappearance. Craig is found murdered in the park with his throat slashed. ~ Mac was one of the detectives assigned to the taskforce investigating Tommy's disappearance 20 years ago. ~ Lovato (Natalie Martinez) works the case with the team, and Flack has the day off. ~ Flack has been taking boxing lessons for the past three months, and we see him trading blows with his teacher, Tony. ~ We meet Flack's grandmother, and his sister Sam (Kathleen Munroe) appears as well. We find out that Flack and Sam's father, Henry, recently passed away. We also find out that their mother left their father at some point in the past. ~ There's a flashback to when Flack was 8 and Sam was 6, when they went to a baseball game with their dad. ~ Jo is starting to suspect that something is up with Mac - it doesn't look like she knows about his memory problems yet, but she's aware that something is going on. ~ Several scenes from this episode will be filmed on location in NYC. ~ Adam tells the girls in the precinct about a man named Phil as a lead-in to the "princess" story. Phil was arrested for murder, and he confessed to dumping the gun he used in the Turtle Pond. Hawkes went diving to locate it, but the water was too murky. Mac had the pond drained, which allowed the team to locate Phil's gun, but it also revealed the body of the woman in the ballgown, Ashley. "CSI: New York": In the fifth episode of the season, a murder gives the team reason to reopen the 20 year old case of an 8-year-old boy, Tommy, who went out to walk his dog and was never seen again. The case hits very close to home for Don, and we'll see him and his sister Sam in a flashback to when he was eight years old and she was six, in a moment that . CSI: NY's Gary Sinise and Sela Ward flew to San Francisco from the show's L.A. home base to shoot the gripping Oct. 12 episode (8/7c, CBS), which finds their characters, Mac and Jo, embroiled in a puzzling murder case. Along the way they are joined by Jo's ex, FBI agent Cade (thirtysomething's Peter Horton, left, who's guest starring). The City by the Bay's stunning architecture — including The Palace of Fine Arts rotunda — provided a scenic change of pace for the usually gritty show. Another perk? The trip gave the cast and crew a much-needed break from the intense weather. "It was a treat for our team to escape the 110 degree L.A. heat," says executive producer Pam Veasey. Next up: New York City, where they'll likely film scenes at Central Park and Chelsea Piers.